Let me break it out to you by guaranteeing that if you watch this movie you will be at a minimum entertained. Since films are made with that intention in mind, we could all agree that this production did their job exactly as expected. Although, something has to be said for the collection of mockeries that continue to test our patience and make us feel like we've been robbed and laughed out of our hard earned cash. Yes. Don't look away. You know who you are... Grab a tub of popcorn, bring your favorite movie companion, sit down, and prepare yourself to have a decent time. The premise is simple. Edgar Allan Poe, famous horror novelist of the time. You do know this is a period piece you are watching? 1800s? ... Ok. So, Poe's finals days on earth are a bit of a mystery, and Hollywood decided what better way for a famous horror novelist to spend those last few days of his life than to get entangled in his own horror fare. Brilliant. Yes? Obviously the guy didn't get enough of it in his factual life. Our guy finds himself in the middle of what appears to be the endless pursuit of a criminal that uses Poe's famous novels as staging for fresh murders of his own. And, to make things a bit more edgy, the bad guy kidnaps Poe's bride to be moments before they're about to announce their engagement. Intense and puzzling. Definitely fun. Since I'm a guy, I'm going to point out to my fellow men that this is not the kind of movie that's going to get you laid. John Cusack used to do those kinds of movies back when. But he's gone from holding a boom box like no one else could in "Say Anything" to becoming an irate alcoholic with a penchant for poetry and even a streak of suicide in this one... Well, I did tell you this movie won't get you laid. Now, ladies, I do hear some of you find Mr. Cusack attractive. But if he's not your cup of tea, Luke Evans might just do the trick. He's a handsome foreigner from Wales that holds the eye. Both actors do a good job at the act. Their roles are convincing and well written. 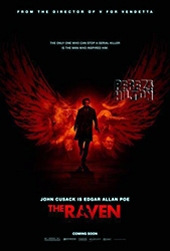 It would be superfluous to give Cusack the extra credit for playing Edgar Allan Poe. A clearly challenging role. He's after all the movie star here and expected to get the film to recoup moneys invested. John! You got a few bills from me! Happy to oblige! The rest of the ensemble played it well. Alice Eve looked fantastic as the lady in distress buried in a basement. Literally. She had a few choice words at the start. Even read some poetry here and there. But her talents were largely invested later on in the picture. Wearing a super tight bustier. Crying, sobbing, begging and screaming from under a pile of dirt. I ran this by an actor friend of mine and he did confirm it is a tough gig to do all that nonsense while laying flat on a hard wood-plank set for 12 hours straight. So, props to you Miss Eve. It looked fantastic from where I was sitting. In fact, I was pleased to see her role was written as a tough chick. There are moments when she actually shows more balls than the largely depressed Mr. Poe, who is supposed to come rescue her. You have to love a tough chick! Right? Brendan Gleeson is worth a mention. For some reason I particularly liked his character. The tough old man that came this far in life. Money. Power. A great -looking beard. And his daughter gets the crap end of the stick. I mean, aren't all parents expected to have their daughters date broke alcoholics with irate tendencies and fans with criminal intent? You see where I'm going with this... But Mr. Gleeson was as convincing as his role firm. When I grow up and get old, probably should say older, can I be just like Gleeson's character? Tough as nails! As far as the plot was concerned. I already told you above what the studio wants you to know. But if you want more I gotta warn you there might be some spoilers ahead if you keep reading. I mean, we are discussing a mystery. If you want my 2 cents I might have to tell you about the mystery in question. Just so we are clear. I pretty much told you to go see this movie in my opening sentence. And I am pretty confident you will be entertained. However, I am partial to mysteries done a certain way. What can I say, I like beef medium rare. Not any other way. I have never read Edgar Allan Poe. I did buy a collection of his works that is sitting somewhere around here. God knows where... 'Know what I mean?... Maybe if I read his stuff I wouldn't make the following statements. But I didn't. The story line, however interesting, it follows a chain of events that unfold one after the other in a consequential manner as presented in the screen. With no hope from the audience to anticipate much of what will happen next. Personally, just like my steak, I like to see where my story might end up. I want to feel half intelligent and be presented with clues that allow me to participate in the crime solving. Just so I feel a bit smarter leaving the theater. Not that I would be. But a little pretense is nice sometimes. Specially having made a monetary investment in the viewing. Some of you out there, though, like to sit down and eat whatever is served without expectation or involvement. un-plug completely, if you will. In that case, you are in the right theater. This is that film. The puzzle of crimes and locations and little clues and fantastic mask balls and horse chasing in the beautifully photographed mist is quite cool to watch. So, as I said. I'll reiterate. It will all be very entertaining... And that's it. As far as the role of the criminal in the movie. This is where I reveal the killer. So, stop reading if you don't want to see the Wizard today... The criminal, as I was saying, is the newspaper's Type-setter. I did get a vibe early own that it might be the newspaper owner somehow. He has a clear ongoing conflict with Poe and that would be the obvious place to look for our culprit. But, close enough. The Type-setter. This is what bugged me. The weaving of ghastly events with the occasional screaming of Miss Eve was total fun. But the Type-setter? Really? ... I mean, I didn't live in that period. But, when you do watch the movie, or if you did already, a lot of the settings and arrangements this guy has to go through to commit and imitate Poe's fictional crimes are very sophisticated and expensive. I didn't live in that period but do Type-setters make that kind of dough? 'Cause I'm down to send my resume. Plus, It takes some serious knowledge of mathematics, physics, and even structural engineering at one point. You know, that awesome pendulum. I mean, even Poe walks in on that murder scene and marvels at the giant construction. This is no joke a superbly smart guy. Now, would a guy with that kind of scientific ambition and passion go as far as committing these crimes? OK, so it's a movie! Don't get all touchy. I did promise you would be entertained. But come on! When discussing possible suspects even Poe himself tells the detective that this has to be the work of someone sick. Seriously, no one I know this smart would also be this sick... They would have started a tech company. It gets better. Let me tell you about the motive. The killer loves Poe's stories so much, since he's been type setting them all at the newspaper, that he can't stand the idea of Poe retiring to drunkenness and marriage. That is why he kills people. Seriously... He forces Poe to solve his murders as a means to get Poe back into writing a final novel... All I have to say is this: Mr. Stephen King, be careful if you ever wanna enjoy retiring with a fine lady like Alice Green. Some psycho might go into a killing rampage to get you to write a sequel to "Pet Cemetery." Wouldn't it have been easier to gather up the clearly absurd amount of money spent on the staging of all those murders, and hand it over to Poe to write a final book? After all, the movie starts with Poe pretty much begging every one he knows for money... Trust me. He would have taken the dough and written something that doesn't involve transforming robots. Guaranteed. All in all, I was happy to spend my money on this movie and I definitely recommend anyone with a couple of hours to kill to go see it... unless, of course, you're just looking to get laid. A final note. Tell Luke Evans to blow a bit harder when putting out candle lanterns in catacombs. That lantern was clearly lit in the following shots.